A one page handout to encourage students to explore the illusion of SPACE in 2D art through investigating/experimenting with LEADING LINES and LAYERING using photography. 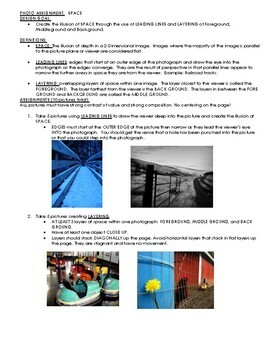 This assignment can be done with a phone, tablet, or camera. Digital photography is a great way to generate primary sources in drawing classes as well. I have used this assignment in both AP 2D Design and my Advanced and AP drawing classes to encourage experimentation with COMPOSITION and SPACE or, as I tell my students, to help students go beyond flat centered images. We all know how to center and create flat images from childhood on. Creating the illusion of space is more of a challenge. One page with directions and examples.